Over the past couple of weeks, we at IDA have been introducing our community to the filmmakers whose work is represented in the DocuWeeksTM Theatrical Documentary Showcase, which runs from July 30 through August 19 in New York City and Los Angeles. We asked the filmmakers to share the stories behind their films--the inspirations, the challenges and obstacles, the goals and objectives, the reactions to their films so far. children like Alcides can make new families out of tragedy. Alcides Soares: I started with help from Reencontro, an NGO that is looking after orphans in Maputo, Mozambique. So when Neal Baer and Chris Zalla came to visit to teach orphans photography, I showed them my artwork. Neal asked me if I was interested in making a film about my search for a new family after my father died of AIDS, and I told him, "Of course!" We talked for a long time about my life, and Neal and Chris then taught me how to make a film. which we sold to PBS. One day, I overheard Ed talking to another professor about my work. I'd made a film about an Italian cakemaker in Sommerville, Massachusetts. Ed waxed on about the images I captured of this baker applying whipped cream to every pastry he made-- delicate whorls along with thick trails of cream everywhere. Hearing someone enthusiastically respond to one's work can send you in directions you never dreamed possible. IDA: What inspired you to make Mozambique? same for many other orphans. because I wanted an orphan to tell his own story, rather me telling it for him. me. The second challenge, perhaps the most difficult one, is to have to tell people about HIV and how my parents died because I thought that people would discriminate against me. But by making this film I was sensitized to take courage and go on with life. I was greatly helped by Reencontro, and I was never discriminated against because of my parents´ health status. years--a way of putting people at ease and getting them to tell their own stories. I thought these qualities, which you cannot teach, were fundamental prerequisites for the young person who was going to make this film. Then Chris and I had to teach Alcides the actual elements of filmmaking: how to use the camera and tripod; how to check to make sure the sound was being recorded; how to frame. We took a chance on Alcides and it paid off. He's an artist. He's got a great eye and an open heart. And he instinctively knew how to work with his subjects to help them to tell their stories. AS: It changed beautifully because I had never made a film before! I just shot my life, and Neal cut it together. I was surprised, though, by how much he left out! NB: We really had no vision. 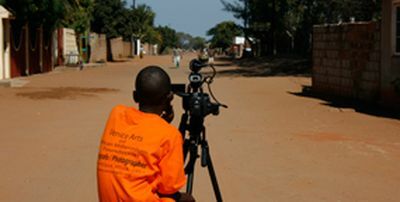 We selected a young AIDS orphan to make a film to tell the world his own story. We were completely at the mercy of Alcides' vision, whom he wanted to interview and how deeply he wished to expose his own life. He probed deeply, both with his interviews and in himself. We also used photographs in the film taken by 18 orphans who were taught by Jim Hubbard, one of the first people to give cameras to children so they could document their lives. Those photographs show the richness of the lives of these children in ways an outsider's lens could not. We had no idea that we'd be using the photographs, but they enrich the film. IDA: As you've screened Mozambique--whether on the festival circuit, or in screening rooms, or in living rooms--how have audiences reacted to the film? What has been most surprising or unexpected about their reactions? AS: A lot of people liked my film and a lot of them at the end were asking questions about the film; some were even crying. I was surprised that it moved people, because it's only my life. NB: Whenever I speak about AIDS orphans in the abstract--say, presenting the statistic that there are 20 million spread across Africa, I get blank looks. People can't comprehend numbers like those. What does it mean, 20 million? But when an audience sees the film about one young man's journey, they are forever changed by the story. The documentary moves people because they can relate to one young man's search for a family, for a better life for himself and his siblings. And once they've been moved by the story, they are more likely to take action in some way to help alleviate the suffering of all those faceless statistics. AS: My great inspiration is Chris Zalla, the person who taught me how to use a video camera. and honest--stories in his footage. Little moments in Wiseman's films--a gesture, a look, a behavior--can tell more than a scripted voiceover. I learned, by watching him, to be patient. Mozambique will be screening August 13 through 19, as part of the DocuWeeks Shorts program, at the the ArcLight Hollywood in Los Angeles.